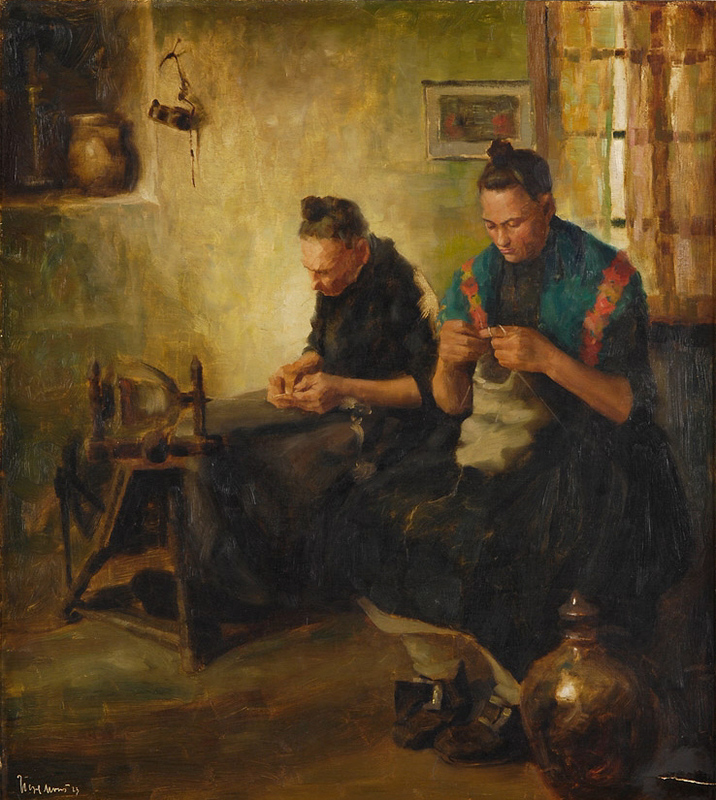 "Rural Household Chores", German oil painting ca.1900. Artist unknown. I just found another one of these old wool-craft paintings. This one appears to be an oil with an illegible signature; it is dated about 1900, and I think it’s German. Just two women alone . . .
It’s piquant: sweet and sad at the same time, and with the usual symbolism that you find in these things. Mother and daughter sit at home and hatless in the usual bare room, working in the light of the closed and curtained window. Mother is elderly; she spins a fine thread, while her strapping daughter knits something shapeless and in the round – too big for socks, and it’s not a sleeve . . .
. . . not sadness . . .
. . . It could be a shroud for a baby. Daughter’s water jar sits upright and firmly stoppered by her feet; she wears no ring; she’s unmarried and has no baby. Her mother’s water jar is empty; finished and put away on the shelf – the sign of a widow, perhaps. Or was mother ever married? No ring is visible. Daughter depends on her mother’s spinning for her yarn, but her thread is running out: it perhaps references her genetic line running out? And her shoe buckle is undone – some linguistic German reference there, maybe.
. . . but serenity . . .
It’s not sad, though, because they’re living in the moment. Mother is hunched over her spinning, taking great care in her fine work. Daughter wears a gorgeously-coloured shawl – woven and dyed by these two, maybe? Or an exotic and imported gift from a past admirer? She too is raptly concentrating on her work; it’s her pleasure and maybe even redemption. The redemption of both is signified in their hands: beautiful, powerful yet elegant workwomen’s hands which create fine artefacts. A light shines on their peaceful faces, and it doesn’t come from the window. Even if they have no descendants, the world will have the results of their work. So can we appreciate that? Our respect is maybe all they have.